I ate a burger today. Actually, it was a double cheeseburger. I was alone. No one who knew me was anywhere close. I thought it was a good idea at the time. 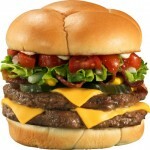 I once went 17 consecutive years during which I ate at least one hamburger a day, sometimes 3 or 4. (I am sure that some of you out there have borne witness to all or part of that streak.) Here are some of my favorite burgers. What are yours? Steak n’ Shake, road trip stop in the Southern or Midwestern United States: all this thinking about burgers has made me crave a shake! This entry was posted in Food and tagged Burgers, Food, Tater Tots, Travel, White Castle. Bookmark the permalink. The reason you love burgers so much is because when I was pregnat with you all I could afford was chopped meat, hence burgers in all ways possible! In Charlottesville we have Five Guys and Steak’n’Shake, but really the best burgers are at our house, owing in no small part to the quality of the bacon. Growing up in LA, you almost can’t help but be a big fan of In-n-Out, and I am! But, I routinely find that East coasters and Europeans just don’t think they’re any good. Taby’s in Oyster bay makes the BEST turkey burger to be had. Turkey burgers are NOT burgers!!!!!! Just opened on 3rd avenue and 36th street …. BAREBURGER. If you are more adventurous they have the classics but they pride themselves on the ELK, LAMB, BISON & OSTRICH. Great advice. On my way to 5 Napkin Burger. I agree about Bar Boulud! Amazing burger! IN-N-OUT and Five Guys, in the fast food category. McDonald’s next to Celebrity Lanes in Denver (the first McD’s in Denver) when I was 6 years old — I thought I died and went to heaven…. a man who knows his burgers! Have you tried an in~n~ out burger? I have. Disappointed! Haven’t yet tried Five Guys.